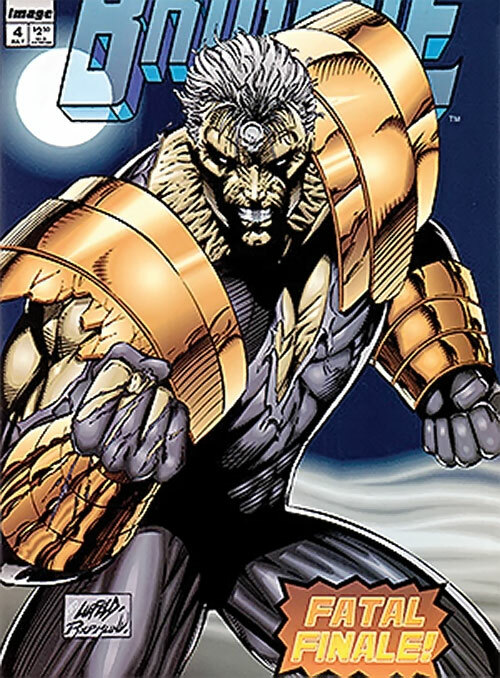 Battlestone was part of the original wave of characters from brand new publisher Image Comics – in 1992. Most of it was terrible, and Battlestone tended to appear in the worst material. But it doesn’t matter, because it sold like gangbusters. Battlestone is not intrinsically a bad character, and could actually be an interesting NPC – a tragically flawed undead super-soldier with a really lousy life. Beside, the early Image material has such a generic quality to it that it can be inserted into nearly any campaign environment. Writeups.org does appreciate such convenient “plug and play” characters. Early Image characters existed in a shared universe, but this eventually shattered. Battlestone thus ended in the Awesome Comics portion of the former Image Universe. 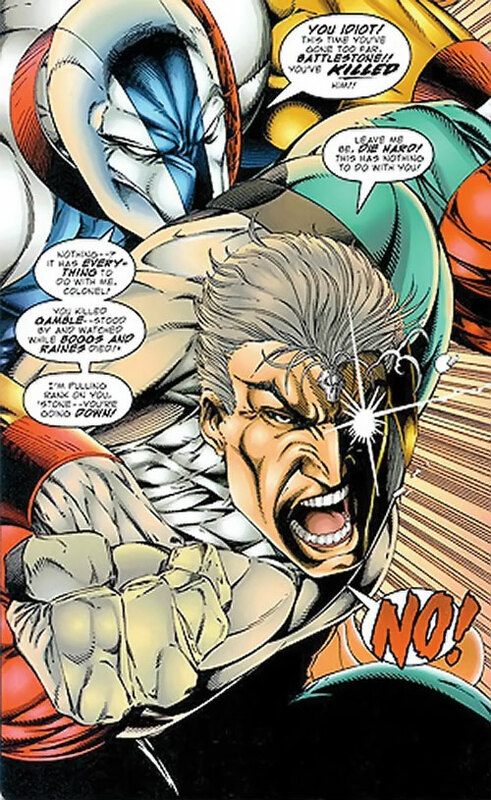 Early adventures featured characters who would end up in other portions, such as the Wildstorm Universe (like the WildCATs) or the Larsenverse (like Savage Dragon). The continuity is a mess, and since everyone was a brooding loner with a mysterious past revealed in bits and pieces it is possible that I missed some bits of Battlestone’s background. Real Name: Colonel John Annex Helix Stone. Note: The name has been given as John Helix Stone and John Annex Stone – so I did the usual Robertbrucebannerisation . Known Relatives: Michael (aka Quantum, father), Cabbot (brother, aka Bloodstrike, aka Bloodhunter), unnamed mother (deceased), Kaitlin McManus (aka Crucible, half-sister, deceased). Group Affiliation: Director of Youngblood. Former member of Knightstrike, of Youngblood ; former leader of an unnamed team (Lethal, Kayo, Boone, occasionally Hacker) ; former leader of Brigade I. Base Of Operations: As Brigade leader — Malibu, CA ; later an island compound somewhere in the Caribbean Sea. Height: 6’4” Weight: 265 lbs. Eyes: Blue Hair: White (originally auburn). John Stone was perhaps the most formidable soldier in the US military during the Second World War. Well, barring such exceptional cases as the experimental super-soldier Die Hard. He was still operating in the 1980s, at which point he looked to be in his late 30s. Obviously, he does not age normally. The simplest explanation might be that he has an active nu-gene slowing down his ageing. It seems that all male members of the Stone family have some sort of enhanced robustness that includes anagathic effects. After his resurrection, Battlestone becomes super-strong and practically indestructible. Pinning down his durability is difficult, however. Sometimes he seems to be invulnerable (and is amazed when something manages to make him bleed), sometimes ordinary arrows and spears draw blood – though he does not seem to be hurt by these cuts. The game stats have been set to a hazy medium to reflect this. His status as an unliving person is also unclear. For instance, he needs to breathe, eat, etc.. The only facts pointing at his supposedly unliving nature is that he does not feel pain, and his unusual skin tone. In every other respect he seems to be a normal super-tough guy. John Stone was born in the 1920s. His father Michael had some peculiar ideas about the way “real men” should be raised. For instance, he encouraged violence between Johnny and his smaller brother Cabbot. Though this stance horrified their mother, Michael Stone thought it would make John an alpha male and toughen Cabbot up. Apparently, the Stone men were nu-gene bearers (mutants, in less trademark-friendly terms). Michael Stone would later become Quantum, the local equivalent of Magneto. The impact of the nu-gene on John and Cabbot is unrevealed, though it likely contributed to their massive physique and slowed ageing. When the USA entered the second World War, young John Stone proved himself to be an exceptional soldier. He was such a fantastic warrior that he ended up joining the main American group of superhuman soldiers, the Allies. Their roster included such major figures as Supreme, Glory, Roman, SuperPatriot or Die Hard. Roman was the one who had requested that Stone join the team. The over-enthusiastic young man was given a code name (Battlestone), some sort of experimental laser pistol and a skintight blue costume. He later switched to a pair of handguns and a black combat uniform similar to the Marvel Universe’s S.H.I.E.L.D. jumpsuits. Among the Allies, Stone was somewhat out of his depth – and smitten with Glory. His experience with the team seems to have generally been disappointing for all involved. His mentor Roman eventually left the group due to repeated conflicts with SuperPatriot. After 1945, Stone became a paramilitary asset for the American intelligence and counter-intelligence apparat. He came to work for Graves, the man who would much later command the Youngblood initiative – and later still be exposed as a demon. Much of Stone’s activities during the Cold War are undocumented. But apparently many operations involved strikes against the high-tech terrorist organisation Cybernet, one of the main covert menaces of those decades. During that time, the former young war hero evolved into a testosterone-dripping psychopath, but remained an invaluable asset. This is presumably during that time that he rose to the rank of colonel. At some unclear point — perhaps in the 1950s — Stone was trained in combat by an expert named Cartwright. In the early 1970s, Battlestone clashed with his father, now calling himself Quantum and protecting nu-gene mutants. Nu-genes were widely reviled and considered a menace. Back then Quantum was less powerful, and the hero Sentinel apparently stopped him several times during various crises. When Battlestone and the original New Men clashed with Quantum it was a major event – though the details remain unrevealed. Early during this emergency, Mrs. Stone was killed. John blamed his father for this. But it would seem that the actual culprit was the Brotherhood of Man, an anti-mutants militia. As the conflict came to an end, father and son were sworn enemies. Quantum was locked in stasis within a dedicated undersea prison. In the 1980s, CIA director Jason Wynn assembled several covert teams composed of near-superhuman special forces troops, called Knightstrike teams. One such team was under the command of John Stone. It included Al Simmons (who would later become Spawn), Bruce Stinson (aka Chapel), Dutch (apparently a future Youngblood operative) and a man called Duke (no relation). Cabbot Stone was also a Knighstrike operative, though it is unknown whether the two Stone brothers had any contact. Cabbot Stone was eventually killed, presumably during an operation. His brother greenlighted Cabbot’s transfer to project Born Again – more on that later. 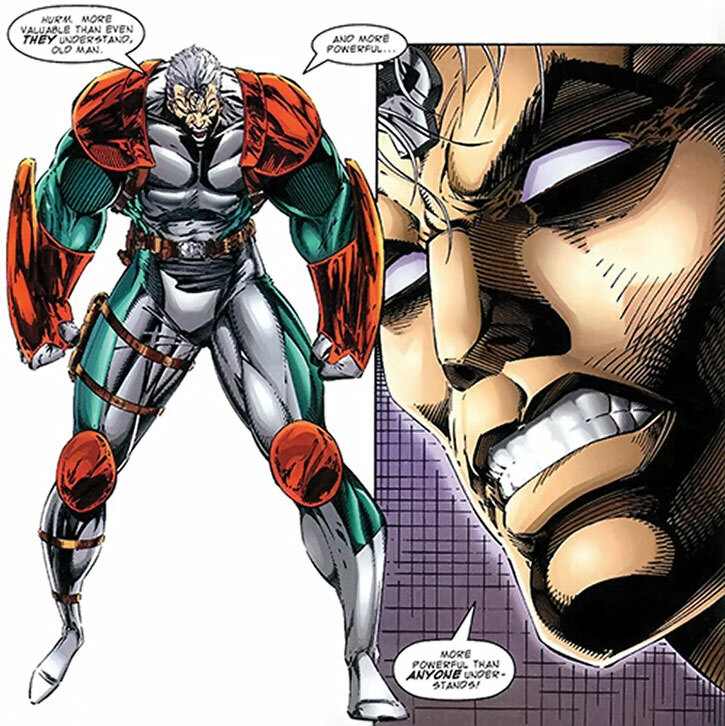 Wynn’s Knightstrike operatives served as a forerunner for the Youngblood project. However, Wynn was actually in league with Giger, the mysterious master of Cybernet. Furthermore, Dutch was a Cybernet plant. During an anti-Cybernet mission under Philadelphia, Duke and Simmons were too seriously wounded to go on. Thus Stone, Chapel and Dutch continued without them. A short time later Chapel was separated from the other two, and Dutch seized the occasion to unexpectedly shoot Stone in the head from behind. Some factions within the Agency (presumably led by Graves) were determined to keep their pet uber-soldier. Stone’s corpse, probably recovered by Chapel, was sent to a top-secret project called Born Again. Born Again technology could potentially resurrect the dead. And this is exactly what happened with John Stone. He even gained superhuman strength and durability in the process, though his grey hair turned white and his skin gained a deathly, ivory complexion. His psychological stability also further degraded. One early mission as a resurrected man was the murder of his former teacher Cartwright. This may have been ordered by Graves as a loyalty test. Stone was successful. The undead super-commando was soon transferred to the successor project of Knightstrike, free of Cybernet infiltration and directed by Graves. That was the Youngblood initiative. 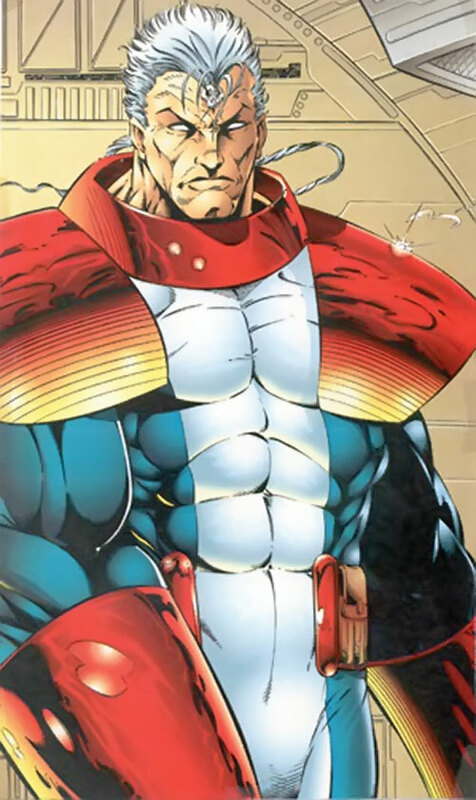 Youngblood included a large number of super-powered and enhanced operatives, and Colonel Stone was heading one such team. It included old acquaintances Chapel and Die Hard, plus more recent operatives Riptide, Colonel Boggs, Raines, and Gamble. However, Stone’s dysfunctional tough-guy leadership was a problem. Half the team hated his guts, and many officers above Stone considered him a loose cannon and a disaster in the making. Still, Stone held a quite senior position in the Youngblood project. That presumably was because he was Graves’s creature. In 1988, the US decided to covertly stop an Iraqi incursion in Kuwait. Since the situation was too big for a SEAL team, a Youngblood team had to be sent in. And Stone’s team was the only available one. With some hesitation, the President greenlighted the operation. Initially, it worked. The incursion was stopped, and Stone’s team started considering the mop-up and counter-strike. It then went south. Boggs — who openly hated Stone and considered that he should be the one in charge of the team — disobeyed orders. He decided to clean up some enemy caches, along with Raines. Booby traps apparently blew both men up. Gamble then accused Battlestone of having let the two disobeying operatives go to their death just to be rid of them. In a fit of rage Stone struck Gamble, killing him. Die Hard reacted by beating Battlestone into a pulp. Chapel then arrested their unstable, undead CO.
Stone’s handlers decided not to court-martial him in order to avoid making waves. Thus, he was quietly discharged. Stone claimed that the problem was with his operatives (especially after he learned that Boggs and Gamble were artificially-grown clones), but undermined his own credibility in so doing. The part where he ranted about reanimated and artificial soldiers being a grave mistake, and that the unliving would eventually gain power and rule the US and the world, did not help. With Stone gone, the Youngblood directors selected a much more media-friendly leader, the archer whom they code-named Shaft. Soon, Stone assembled a mercenary team of elite agents, most of whom he knew from his prior activities. Those were Lethal, Kayo and Boone, plus occasionally Hacker. This group operated clandestinely. But in 1991 Battlestone tired of this and decided to make the team more high-profile. 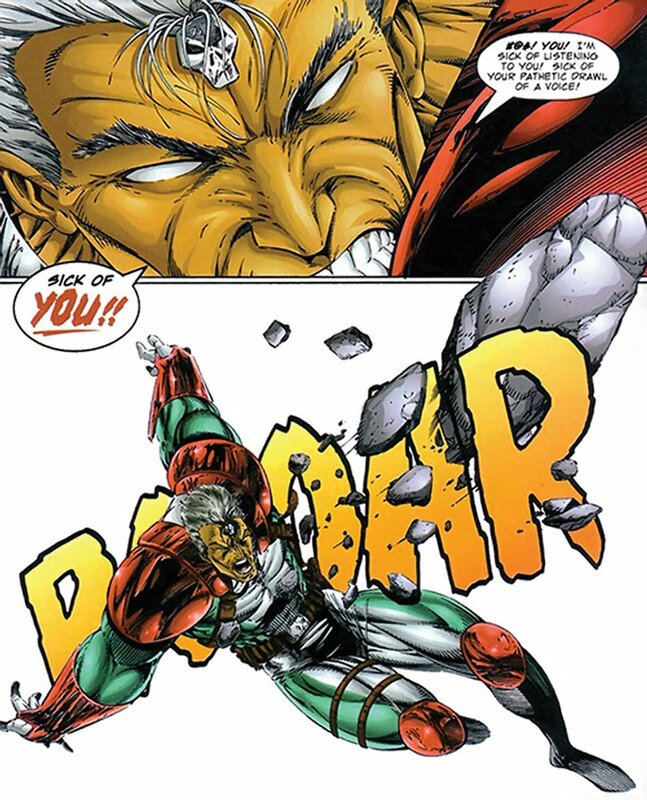 After they assassinated major Japanese crimelord Tatsu Soroyama, Stone used that hit to promote his team in the mercenary and superhuman worlds. This led to bigger contracts with their main employer, Jacob Marlowe. In particular, Marlowe told Stone he was looking for a special gem, which Graves was also after. Marlowe’s men had located the gem in a government installation in Virginia, Stone’s team was sent in to steal it. This was a trap organised by Graves to determine who else was after the gem. Youngblood operatives Shaft, Die Hard, Vogue and Badrock pounced on Stone and his team, forcing them to retreat. Marlowe having warned Stone that this contract was do or die, Stone dismissed his team without explanations, creating bad blood with most of his operatives. Kayo stayed with him, though. Battlestone still wanted to create a high-profile, independent, superhuman cadre. His goal may have been to steal Youngblood’s thunder. At this point, Kayo and Stone heard about the Barros brothers, who lost their father and gained super-human powers in a submarine accident. The Barros family was rich and famous, and Kayo and Stone realised that recruiting the brothers would be their ticket to accomplishing Stone’s goal. It was enough money to offer superhuman fighters an alternative to governmental service as Youngblood agents. Convincing the Barros brothers to both join and fund his operation, Battlestone soon assembled a California-based super-team called Brigade. The Barros brothers were code-named Coldsnap and Seahawk, and the subsequent recruits were Atlas, Thermal and Stasis. Though Brigade was supposed to be a big thing, it never really worked. One of their first missions, against an uninspired terrorist operation, did save the hostages but resulted in the uncontrolled demolition of a downtown high-rise. Brigade had simply barged in without any intelligence of either kind. Their exploits nevertheless attracted the attention of an alien warrior prince calling himself Genocide, who came to Earth to fight them. After major collateral damage, everybody was teleported to Genocide’s home planet. Brigade members took a while to extract themselves from this situation, and Atlas was killed in action. During the flight home, they spent months cramped together in a small spaceship. This resulted in considerable friction. As soon as they got home Stasis walked out on the team. But she was immediately killed by the Bloodstrike operatives ambushing Brigade on governmental orders. Bloodstrike, led by a smirking Cabbot Stone, also grievously wounded the Barros brothers. When Battlestone attempted to have Born Again facilities resurrect Stasis, they foiled him. This likely wasn’t the first time that the dysfunctional sibling rivalry led to the death of outsiders. Battlestone hurriedly hired Boone and Lethal to come to the rescue and save the Barros brothers. Though they succeeded, Stone’s little brother’s onslaught had left the already dysfunctional team badly damaged. Furthermore, the authorities covertly considered him a threat. That he and his operatives could survive a Bloodstrike hit reinforced that view. Lethal left again, and Kayo left to attend personal business. But this time around Boone stayed. He had an excellent reason to – he was secretly blackmailed by US intelligence to be their plant close to John Stone. After they licked their wounds, Brigade was recruited by Battlestone’s wartime mentor, Roman, to help bring an undersea threat under control. Brigade defended the aquatic city of Neuport against the forces of Worlok (or Worlock, depending on the page). This didn’t quite work either. Seahawk and Coldsnap were captured, and Battlestone had to be possessed by Roman’s sorcerer Trident in a desperate attempt to save the day. Trident in Battlestone’s body managed to repulse Worlok and his troops. 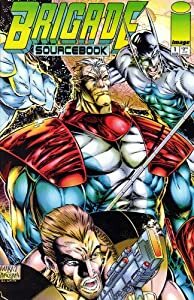 The universe was then rewritten for a short while to become a fusion between the early 1990s Valiant universe and the pre-split Image universe. In this continuity, Battlestone was the senior operative and combat instructor for the Harbingers Foundation. He had been tasked by Toyo Harada with hunting down and terminating rogue Harbingers. In this reality, Harada’s main cadre of Eggbreakers had the same roster as Brigade before Atlas’s death. But the original continuities soon snapped back into existence. After 20 years in stasis, Quantum finally broke free from the base holding him, with greatly increased might. Having lost decades and still confused over what had happened, Quantum flew to meet with his son John in Brigade’s then current base in the Caribbean. He offered him a new alliance to protect nu-gene mutants. Battlestone rejected him and attacked. Quantum easily repelled Brigade and left. The return of Battlestone’s father triggered a major crisis. The government had two of its teams, Team Youngblood (led by Sentinel) and Bloodstrike, prepare for an operation. 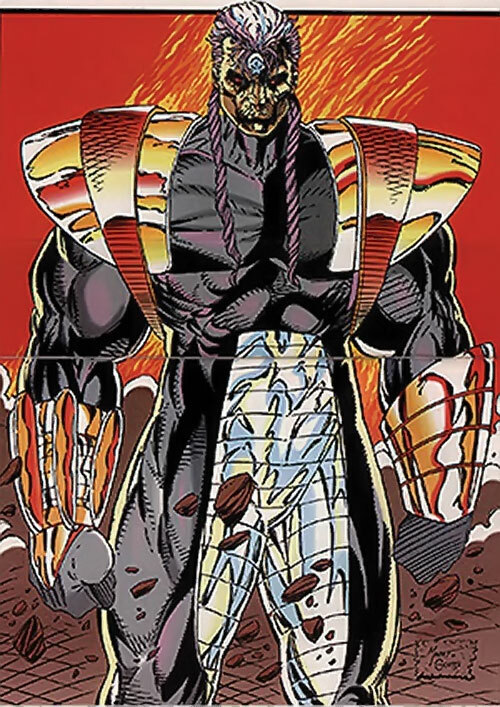 At this point, Bloodstrike was led by Chapel, since Cabbot Stone had proven to be as unstable as his brother John. Chapel and Battlestone were willing to work with each other, and thus Brigade briefly allied with Bloodstrike. This new attempt at taking Quantum out didn’t work either. The still-standing members of the three teams had to prepare for a third try. Several New Men also joined the effort, and Battlestone brokered a deal with a fanatical anti-nu-gene terrorist militia, the Brotherhood of Man. The third try took place as Quantum was wrecking Washington, D.C.. During the operation, Battlestone realised that one Team Youngblood member was the man who had killed him years before – though Dutch said that he didn’t remember anything of that sort. Quantum was taken down thanks to a special gadget constructed by Sentinel, at the apparent cost of Cabbott Stone’s unlife. In the wake of this, Brigade moved back to its Malibu base. Presumably a deal had been brokered to allow them back in the US without pursuit from secretive government agencies. Crucible of the New Men, whom they encountered during the Quantum crisis, decided to join Brigade. Learning that Kayo was being held captive in Japan, Brigade flew there to rescue him. His captors also held the alien gem which Jacob Marlowe had been hunting for years, and the WildCATs arrived nearly simultaneously. The two teams allied to accomplish their respective goals and then parted ways on good terms. Lethal, who also was there for her own reasons, rejoined Brigade at the conclusion of the mission. (At this point, for those of you who are understandably lost, Brigade’s roster was Battlestone, Seahawk, Coldsnap, Crucible, Boone, Thermal and Lethal). The team started disintegrating again due to generally poor social skills of its members and Battlestone’s tough guy leadership. Thermal, who had infiltrated the team all along to write a journalistic report about them, decided not to publish her extensive exposé about Brigade and Battlestone. However, Boone discovered the existence of Thermal’s report. He decided to break cover, stole her material and ran to his I.O. masters. Thermal was thrown into a Brigade cell, Battlestone went berserk and tried to kill Boone, and both Boone and Stone were seemingly killed in an explosion. Both men were actually taken away by I.O. agents, with Battlestone their prisoner and the CD with Thermal’s exposé in their hands. Seahawk tried to keep the team together. But the morale was execrable and what little team dynamics may have existed were gone. Right at this point, Brigade was attacked by the demonic time-travelling assassin Crypt, who seemingly killed everyone save Seahawk. However, Lethal was later revealed to actually have been time-displaced rather than killed. While another team called Brigade would emerge thanks to Seahawk’s efforts, John Stone’s project had been destroyed. What happened to Battlestone after his capture by I.O. director Miles Craven is unclear. Especially since, at that point, the Image Universe had just split and IO had became a part of the WildStorm Universe whereas Battlestone was part of the Awesome Universe. Apparently, he was thoroughly brainwashed so he could again serve as a Youngblood officer. Battlestone now headed a Youngblood team composed of Die Hard, Vogue, Cougar and Combat. He had been turned so thoroughly that he had no compunction to personally head a killing strike against… Brigade. This was the result of a severe continuity clusterfudge — the Brigade members that Battlestone’s Youngblood team murdered had just been killed by Crypt. During this appearance, Battlestone seemed much more collected and professional. Either the brainwashing rewrote most of his personality, or it wasn’t John Stone’s consciousness in there. Generally, the grave continuity mistakes make it impossible to establish what occurred during this area. After this bubble of continuity chaos, by mid-1995, Battlestone appears to be in charge of the Youngblood project. Field team leaders Shaft and Sentinel are reporting to him. This occurs in the wake of the destruction of Alexander Graves after the revelation that he was a demon. However even Shaft and Sentinel did not know how Battlestone ended up taking over Graves’s position, given his history. Stone’s demeanour, intelligence and manner of speech were at that point very different. He seemed entirely in control and behaved much more like an experienced, hard-arsed corporate executive, military officer or senior public servant than his old self. Battlestone later commented that he had been “fixed” by a governmental agency. The Graves fiasco had very nearly resulted in the demise of Youngblood. The agency chiefly survived due to Presidential support and over the reservations of many within the intelligence and military community. Whilst the future of the agency was severely threatened, a hostage rescue mission was launched with Shaft as team leader. It failed as team member Dutch turning against the team to gun down the media mogul Youngblood was rescuing. This failure endangered Youngblood further. But it also led several Youngblood members, especially Shaft, to suspect that something was rotten within Youngblood and that they had been set up to fail by Battlestone. As part of the compromises and policy changes in the wake of the political struggle over Youngblood’s survival, the “Bloodpool” (an agency training superhuman youths to be the future Youngblood agents) was shut down. Battlestone started taking numerous measures to completely overhaul Youngblood, including demoting Shaft and associating with time travellers from the far future. Some Youngblood members later discovered that Battlestone was actually answering to a man in a new position above that of Director. He was called Mr. Dredd, though Battlestone occasionally referred to him as “Lord Dredd”. Originally a shadowy figure, Mr. Dredd became increasingly more active, especially when some of Battlestone’s operations went awry. The next major crisis occurred with the return of The Keep, an extraterrestrial organisation that monitored planets with nu-gene-active individuals. The Keep invaded Earth within 24 hours. They also harvested a number of nu-gene mutants, including Battlestone, his brother and his father. The prisoners escaped, and Battlestone assisted the coalition of heroes opposing the Keep. Thanks to Maximage he came to command a group that was a partially reconstituted Knightstrike unit including Chapel, Dutch and a reactivated Cabbot Stone. Several members of the team, including Cabbot, were seemingly killed in the war against the Keep. But the war was ultimately won by Quantum, who took command of the Keep after defeating their leaders. Quantum left with his new charges for outer space, promising to leave Earth alone. After that crisis, Dredd kept assuming an increasingly direct and heavy hand in leading Youngblood. Somehow still active despite his apparent death, Battlestone was now closer to Shaft’s and Sentinel’s level in terms of authority – though originally without a team to lead. 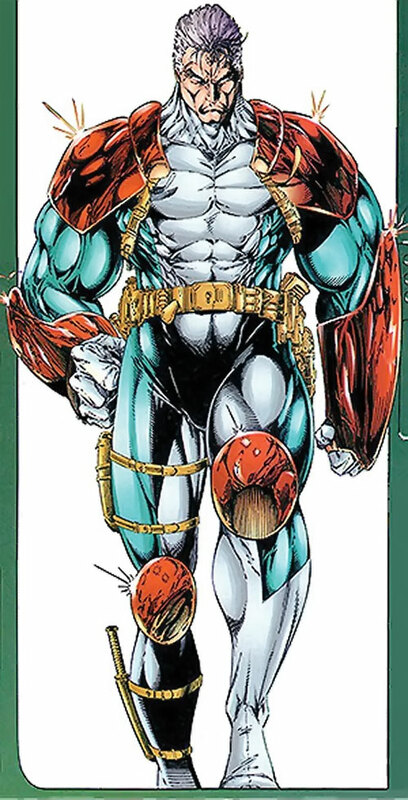 The changes Dredd continued to make solidified Battlestone’s demotion to a team leader role. He was eventually charged with leading one of the three squads (Battlestone’s unit being Combat, Cougar, Brahma and Kia) whilst Die Hard and Shaft headed the other two. Dredd accelerated his plots to break the will and morale of the core Youngblood members, since their suspicion about his agenda was rapidly increasing. Though Battlestone was not part of Dredd’s hit list, he came to realise that his mind had been significantly tampered with ever since Boone’s treason. This realisation left him distraught and filled with uncharacteristic self-doubt. Battlestone is a powerful, grimacing figure. His stark white hair is usually kept in a pony tail, with a miniature skull at the tip of his widow’s peak. His skin has a yellow jaundiced appearance marking his undead nature. His costume is white and blue with the center line being white, and his arms and out side of his abdomen and legs being a navy blue. John Stone has been raised in simplistic, over-the-top macho values that were transmitted in a downright toxic way. His entire life is about being the biggest, strongest, deadliest, most self-reliant, most unfeeling, most angry brute ever. He’s a great warrior, but a poor soldier, since he’s far too undisciplined, self-centred, angry, impulsive and unconcerned with others to genuinely work with a team. Apparently, he was a hero early on. But has been pegged a psychopath for decades, perhaps since his resurrection. Battlestone just doesn’t care about anything except reacting toward frustration with extreme violence, and projecting a “cool”, brooding loner with a trenchcoat-mirrorshades-katana-and-enormous-chip-on-his-shoulder attitude. He does not seem capable of normal human relationships, and treats everyone like crap. His leadership is awful, and mostly based on throwing his weight around and yelling vague, generic orders (usually to attack). I assume most people stuck with him and his “teams” because they saw him as their shot toward the big time. He’s very poor at relating, but he has a solid raw presence giving the impression that he’s a big-time player. Battlestone is all about chest-beating, having an attitude that a young teenaged boy would think is the epitome of tough, killing the opposition dead, and beating people up because he can. He seems aware that something is wrong with him, but his solution seems to act even more like an amoral anti-hero tough guy who makes hard choices and makes his own rules and yadda yadda. His demeanour as Director of the Youngblood agency was very different. Though he slowly reverted to something closer to his prior behaviour, he never became as dysfunctional as he had been. He seemed in fact to be generally serious and responsible, though unpleasant and self-centred. In the DCU, Battlestone would be the field leader of a top secret, failed, first iteration of the Creatures Commando. Originally a elite human soldier, he was killed along with his entire team in a huge explosion, but the Project managed to bring him back as the super-strong zombie of the team. Battlestone has worked for the US intelligence ever since. Brigade could easily have existed in the DCU, and would have been drafted by Amanda Waller to combat the Eclipso threat. Battlestone replaced Major Victory after he died in the same operation, but another man was eventually tapped for the role and Battlestone returned to being Battlestone. In the Marvel Universe, Stone would have served with one of the elite US units of WWII (perhaps the Leatherneck Raiders). 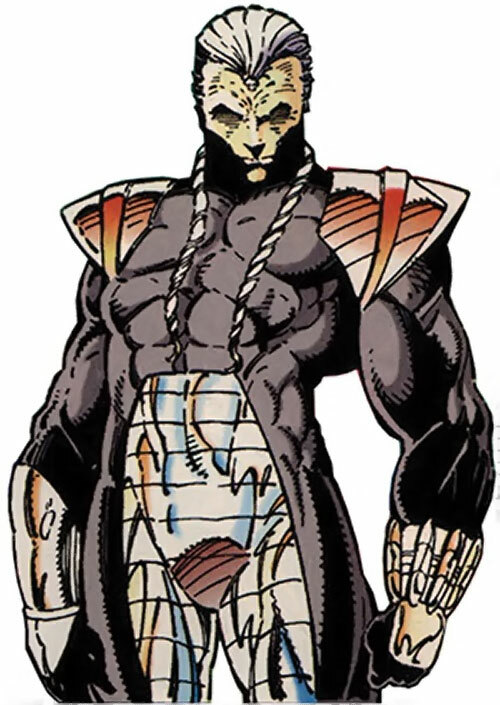 He shared a few missions with the Howling Commandos, then was tapped as one of the attempts to reproduce the Project : Rebirth process after the assassination of professor Erskine. It did not work out and Stone was believed dead for a time. But it then became evident that he was comatose and that the treatment was very slowly enhancing his unconscious body. Kept on ice for nearly five decades, he only awoke in the early 1990s. He evidenced greater strength and durability than any subject before him, with the possible exception of Protocide. Alternatively, he may replace Protocide. Battlestone then worked for a US counter-intelligence unit closely associated with S.H.I.E.L.D. and of aggressively unclear legal status. That by the early 2000s about half his missions were obviously Hydra jobs never bothered him. As of this writing he would be a top HAMMER agent and a key Osborn man within the Thunderbolts and the Initiative. Density Increase is Always On and Already Factored In. Skin armour also works against Energy attacks (+2). Skin armour only protects vs. area of effect attacks (large explosions, collapsing buildings, etc.). Expertise (Military equipment and protocols), Schtick (Pain management (High)), Misc. : Battlestone is presumably immune to effects that specifically target a living person. Creepy Appearance, Socially Inept, Serious Rage, MPI. Officer officer officer officer overseer ! 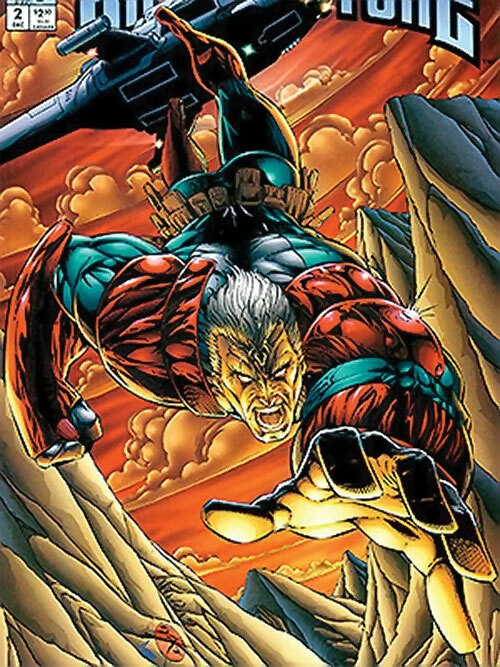 During his first contract with Youngblood, Stone is considered to have Rank (Colonel), Medium Credentials with the Youngblood organisation and associated agencies, and has a High Connection with Graves. During his attempts to develop Brigade, these Advantages all disappear, but he has a Low Connection with Brigade members. 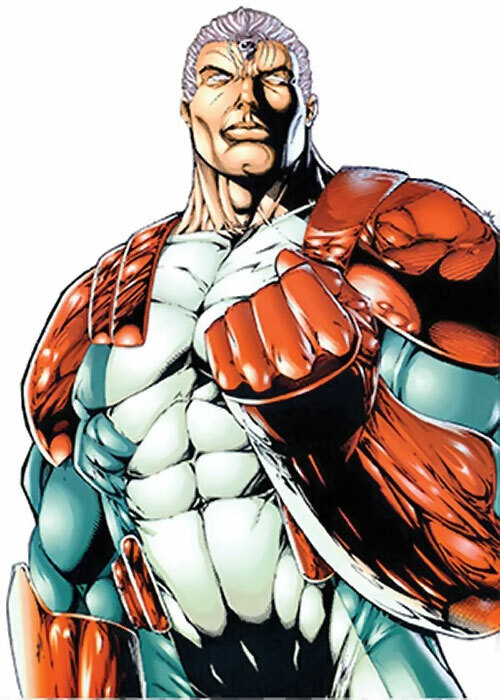 As he returns to Youngblood in the wake of Graves’s destruction, he acquires Rank (General) and High Credentials with the Youngblood organisation and associated agencies. He also suddenly starts demonstrating Charisma: 07 and loses the Socially Inept and MPI Drawbacks. When Dredd takes over, Battlestone’s Rank drops back to Colonel and his Credentials to Medium. The Charisma disappears, but the Socially Inept and MPI Drawbacks do not return. By Sébastien Andrivet and Hartley C. Holmberg. Source of Character: Image / Awesome Universe.